The last meeting in 2012 of the Regional Cooperation Council (RCC) Board heard today a report by RCC Secretary General Hido Biscevic on activities of the organization’s Secretariat in the period May-October 2012, primarily in relation to results achieved in the implementation of the RCC Strategy and Work Programme 2011-2013, as well as information on the future plans. “As our meeting today takes place shortly after the publication of the European Commission’s Enlargement Package 2012, let me express my hope that its findings and recommendations will serve as a fresh impetus for investing greater efforts in the region in overcoming current challenges and moving closer to meeting EU accession criteria”, said Secretary General Biscevic. In the Package, the European Commission emphasized that it “looks forward to the RCC in further developing its role in regional cooperation as a platform for the promotion of issues of importance to the whole region and its EU perspective thus further mainstreaming regional cooperation in the countries’ political agenda”. “I do believe that concrete RCC results, particularly within the South East Europe Investment Committee, the Monitoring and Evaluation Mechanism of the regional strategy on justice and home affairs, the Task Force on Culture and Society, media development etc., although not explicitly referred to in the Enlargement Package, have greatly contributed towards the overall positive assessment of the regional cooperation”, added Biscevic. The RCC Board called upon the RCC Secretariat to open the process of drafting a new RCC Statute and agreed upon the dates of the Board meetings in 2013. The Board members thanked the outgoing Secretary General Hido Biscevic for his dedicated work in promoting regional cooperation in South East Europe over the past five years, and gave mandate to the South-East European Cooperation Process (SEECP) Chairmanship-in-Office to sign the Agreement on the Assumption of Duties with the incoming RCC Secretary General Goran Svilanovic, who will take office on 1 January 2013. The Board was informed about the 10th Coordination Meeting between the SEECP Troika (Serbia, The Former Yugoslav Republic of Macedonia and Romania), the RCC Secretariat and the European Union, held yesterday, as well as about the state of contributions to the RCC Secretariat’s budget for 2012 and 2013. 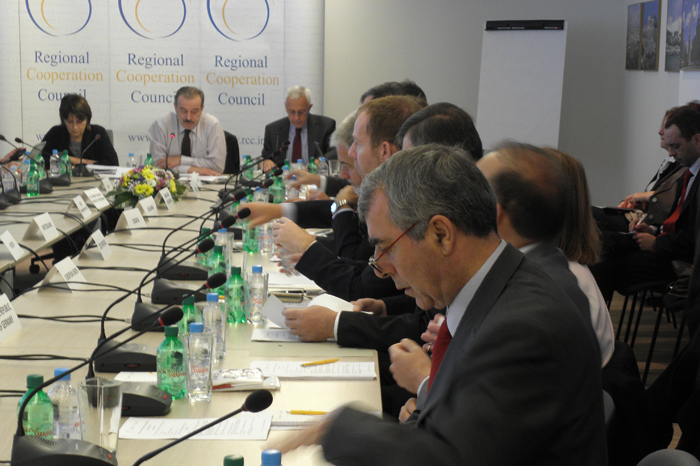 The 27-member RCC Board meets three times a year and is chaired by the RCC Secretary General. The Board provides the RCC with operational guidance and supervision. It consists of those RCC members contributing to the budget of the RCC Secretariat as well as the European Union. The Report of the RCC Secretary General on the activities of the RCC Secretariat.